I’m so excited about the latest anthology from KYSO Flash (that’s Knock Your Socks Off Flash) publishing my story, “Marcus,” in the excellent company of 143 other stories, poems and trans-genre pieces. “Marcus” is a story that came out of a writing prompt, “crass,” so be warned…. I enjoyed creating a narrator quite different from myself and finding some humor and poignancy in her situation. It’s nice to see a story of mine get a second life in print, after being published online. 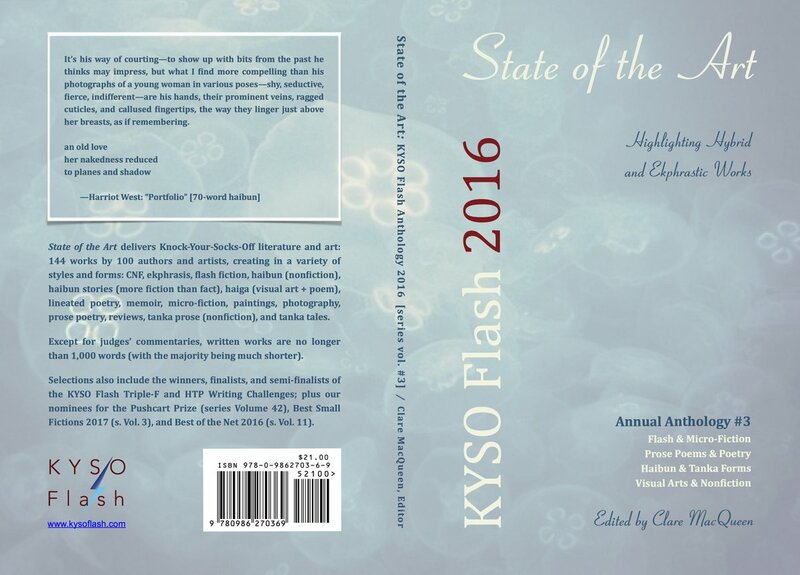 This third annual edition of the KYSO Flash anthology is the best yet. Titled State of the Art: Highlighting Hybrid and Ekphrastic Works, it does what it claims to do — the hybrid forms really jump off the page. (And yup, I had to look up the word “ekphrasitic” too — one of these days I’ll squeeze it onto a Scrabble board!) Haiga — an art form that combines a haiku or other brief verse with an image — grabbed my attention, visual like a meme but with some depth and beauty, the image unfamiliar, the words not a meme-like punch line but something murkier. Haibun combine a brief savory chunk of prose with an amuse-bouche of poetry, a haiku or something like it. Prose poems are another hybrid form that I enjoy, and this anthology allows me to explore further my own questions about the line between prose poetry and flash fiction. I’ve submitted many of my pieces as both. But as I have read more haibun and modern tanka, I love the pared-down pairing of emotion and image, just as I value density in micro-fiction, nano-fiction and flash fiction (forms I adore and somehow don’t experience as cultural appropriation, although certainly the first examples I was blown away by were all Latin American in origin — Cortázar, Monterroso, Borges…). I find myself wanting to try writing a haibun or two, and see if I can manage to do so in a way that doesn’t make me throw up. I want to try a renga — I love renga! One of my sweetest memories of college is of a renga party at the end of my Japanese poetry course in the home of Professor Meera Viswanathan where we composed renga collaboratively in a circle, each of us tackling the challenge of adding either two or three lines (alternating) that connected to the previous two or three lines, but not necessarily to the chunk before that one. Linked tanka in a long chain. So fun! All to say, I am looking forward to reading more of KYSO Flash’s third anthology, getting inspired to write new stuff and trying out some new forms!